Over and over in Beethoven’s music themes of victory over tragedy abound. In the internal struggle he faced, although his music showed the greatest despair and sorrow, it always transcended into triumphant victory. With that same inner struggle, Beethoven learned to transcend deafness and still be victorious in creating greater and greater masterpieces. During the late 1790s, Beethoven’s music began to show changes, as well as enlargement of form. 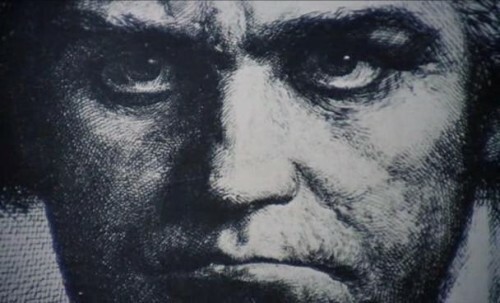 After the Heilgenstadt Testament, Beethoven expressed dissatisfaction with his compositions and according to Czerny was “determined to take a new path.”  The changes included strong links between sonata movements, intensified drama, harmonic instability, motivic elements affecting the larger form, twelve measure structures, registral gaps, recitative and pedal effects. Beethoven’s “Tempest” Sonata no. 17 Opus 31 No. 2, written in the somber key of d minor, is reminiscent of a violent storm with periods of calm and peacefulness. This Sonata is based on three different motives, which are then developed and used in different variations throughout the entire first movement, and continue throughout the entire sonata. The Sonata begins with a slow rolling arpeggio marked Largo on a dominant chord of A Major. This ascending arpeggio is the basic idea and the antecedent phrase of the exposition. This arpeggio is the dominant motive of this entire Sonata with an arpeggiated chord beginning the second movement and arpeggiated chords dominating the third movement as well. Beethoven inner turmoil is clearly exposed in the tumultuous first movement, as well as the striving for inner peace in the impressionistic recitatives. The strong links between sonata movements is shown again as Beethoven uses the idea of the recitatives for the lugubrious second movement. Although the adagio illuminates the composer’s feelings of despair, at the same time shows transcendent spiritual growth with the beautiful lyricism in the second theme group of the Adagio. Beethoven pushes the boundaries of harmonic instability by delaying resolution in the sonata to the very end of the finale. Beethoven has used the sonata form to support his creative demands instead of him conforming to the sonata form. It is as though the first movement is an introduction and transition for the upcoming finale which will take up in d minor where the first movement left off with the rolling arpeggios on the d minor tonic. The finale gives way to a feeling of equilibrium with the principal motive of the arpeggio fading away on the d minor tonic. It is in the magnificent finale of the “Tempest” sonata where Beethoven shows victory over the funereal overtones of the Adagio which could be interpreted as a spiritual death and rebirth. This sonata could be interpreted as Beethoven beginning to come to terms with his impending eventual deafness. The anguish and despair of the Adagio, the rage of the stormy moments of the first movement, contrasting with moments of calmness with inserted recitatives, the ferocious cadences and rhythms of the finale were his way of expressing how he felt about this affliction of deafness while writing the most extraordinary music and not being able to hear it. Beethoven would live most of his life in a great deal of loneliness and despair with most of his life devoted to the development of his art and creativity. As this sonata was written towards the beginning of his second stylistic period many masterpieces would follow the “Tempest” sonata.